Low vase with two handles and a cover; lapis lazuli; slightly mounted in gold, enamelled and jewelled; mouth with moulded edge and row of low bosses encircling the shoulder; below are radiating ribs; two small loop-handles, fluted, springing from acanthus leaves, and on top of each a shield-shaped gold setting containing a faceted diamond and two rubies (an addition? ); flat cover with central knob surmounted by group of Venus and Cupid, enamelled white, with rubies and diamonds round base; head of Venus surmounted by suspension loop; group may be an addition. Origin: Italian, probably Milan or perhaps Florence; second half of 16th century; the two gold rim-mounts and the gem-set and enamelled gold embellishments to the cover and the handles are later additions - made before 1834 - perhaps in London, c. 1811-30. Provenance: Formerly in the collection of the Duke of Devonshire; recorded in a manuscript 'Inventory of Curiosities and Articles of Vertu at Devonshire House, 1834'; also listed under the heading of 'Vases of Stones' in the 1892 Inventory of Devonshire House, London; lent by the 8th Duke of Devonshire to the Burlington Fine Arts Club Exhibition of European Enamels, 1897; acquired by Baron Ferdinand Rothschild about one year before his death in December 1898, along with four other mounted hardstone vessels (see WB.68, WB.69, WB.71 and WB.72). Commentary: The short descriptive entry printed in the lavishly produced ‘Catalogue of the Exhibition of European Enamels’ in 1897 expressed slight uncertainty about the origin of this object, cautiously phrasing it in the following terms: “probably late Roman of about the second century. The cover is Italian, 16th century, surmounted by a small figure of Venus and Cupid”. This view was endorsed in Read 1902 and in Dalton 1927, though in a slightly modified form, suggesting an even more precise date for the mounts, namely “end of 16th century” and, more importantly, neither Read nor Dalton repeated the statement that the lapis-lazuli cover itself was also made in the sixteenth century in Italy. Little evidence has been found to support their view that the vase and cover were perhaps of ancient Roman origin. Today, the Museum's classical specialists are reluctant to accept the view that it could have been carved in the Roman period, pointing to several decorative features that appear to be inconsistent with such an early dating; however, they also stress the difficulties arising from the very small number of surviving examples from the ancient world. Confronted with such a dearth of comparable material from antiquity, other specialists have preferred to keep an open mind on this question. Many of the decorative features can, however, be related to the late sixteenth-century hardstone 'curiosities' that have survived from the Renaissance Schatzkammern of Europe, especially the outstanding collection of lapis-lazuli vessels formed by the Medici in Florence. (For a detailed and pioneering study of this material, see C.W. Fock, Vases en lapis-lazuli des Collections Medicéennes du seizième siècle, ‘Münchner Jahrbuch der bildenden Kunst’, XXVII, new series, 1976, pp. 119-54). In this study, a group of four documented vases are identified as pre-dating the great flowering of this glyptic art at the Medici Court in Florence during the last quarter of the sixteenth century and are attributed to the Miseroni workshops in Milan. All the objects under review in that 1976 survey by Willemijn Fock are far grander and more technically accomplished than the Devonshire lapis-lazuli vase. Even so, one of those four lapis-lazuli pieces is a low bowl (H. 7.5 cm) with a small turned foot, having two small loop-handles in the form of sphinxes which, together with the mouldings and the band of 'beading' (below), have close affinities with the Waddesdon Bequest example; it is now in the Museo degli Argenti, Florence (Kirsten Aschengreen Piacenti, ‘Il Museo degli Argenti’, Milan, 1967, p. 139, cat. no. 206; Fock 1976, pp. 122-3, fig. 3). Another closely related miniature piece in the Medici collections is a covered standing-cup (H. 16 cm), which is made of jasper. The execution of the decorative details provides a striking comparison; it too is preserved in the Museo degli Argenti, Florence (Piacenti 1967, p. 141, no. 244; Kirsten Aschengreen Piacenti, ‘Capolavori del Museo degli Argenti’, Florence, 1969, p. 68, col. pl.). The wide zone of fluting, both on the bowl and on the cover, is bordered by a narrow band of 'beading' of an identical form to that found on the lapis-lazuli vase in the Waddesdon Bequest. Furthermore, the simple turned knop on the stem and the rim mouldings are also very alike, whilst the carving of the two horned heads in high relief (on either side of the bowl) and of the simple finial (on the cover) correspond in general treatment. 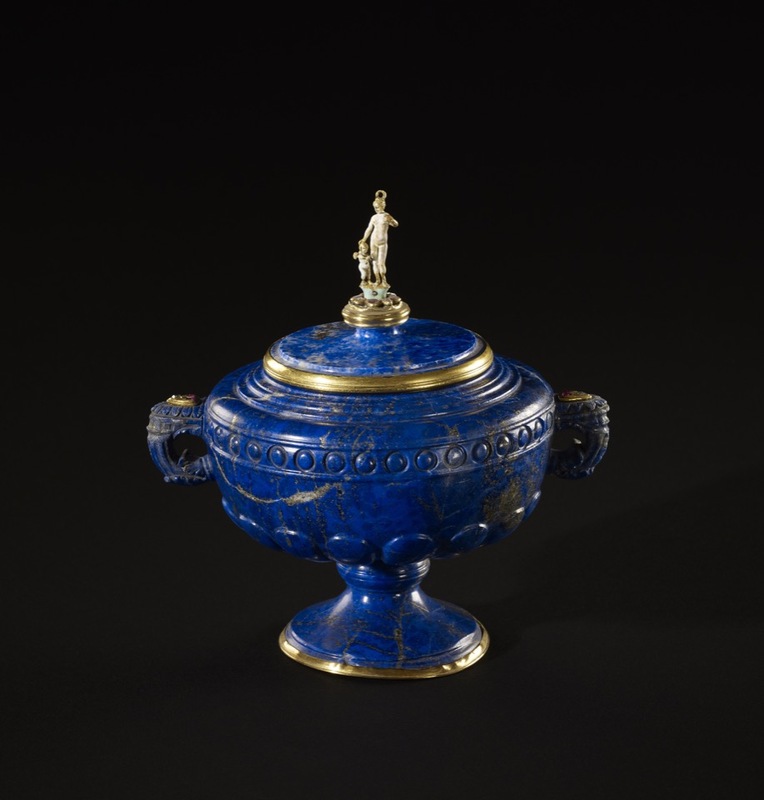 Understandably, the more evenly superior finish on this jasper miniature covered standing-cup is due to the difference in the two stones; lapis-lazuli, being brittle and of a varying consistency, presented unique problems for the carver and, for this reason, the stone became fashionable among princely collectors only in the sixteenth century after the Milanese craftsmen, particularly in the workshops of the Miseroni family, had mastered the difficulties. Many lapis-lazuli vases, cups and tazze are known to have been acquired for the French Court by Francois I or his successors during the sixteenth century, and happily the collections of the Dukes of Württemberg, the Electors of Saxony, the Danish Kings and the Hapsburg Emperors still contain examples of diverse forms and surface ornament (see M. Landenberger, ‘Kleinodien aus dem Württembergischen Landesmuseum, Stuttgart’, Pfullingen, 1973, p. 45 with col. pl. ; Joachim Menzhausen, ‘Das Grünes Gewölbe’, Leipzig, 1968, p. 76, pl. 24; H. D. Schepelern, ‘Trésors des Rois de Danemark’, exh. cat., Petit Palais, Paris, 1978, col. pls 47-8; J. Hein and K. Johansen, ‘Sophie Amalie 1628-85, den onde dronning?’, exh. cat., Rosenberg, 1986, no. 162; ‘Christian IV and Europe’, The 19th Art Exhibition of the Council of Europe, Copenhagen, 1988, p. 181, no. 647; Distelberger in ‘Prag um 1600: Kunst und Kultur am Hofe Kaiser Rudolfs II’, Kunsthistorisches Museum, I, Vienna, 1988, pp. 437 ff, nos 357, II, pp. 206 ff, no. 690). Indeed, the Württemberg Schatzkammer also contains a most remarkable chalcedony covered bowl with a bail- or hoop-handle attributed to a Milanese workshop in the middle decades of the sixteenth century (Landenberger 1973, p. 20 with col. pl.). Its low form, resting on a short stem and circular foot, is enriched with a restrained use of carved classical acanthus leaf and other ornament, including a very similar 'beaded' border around the foot-rim and again around the shoulder of the bowl. The added enamelled gold mounts on the foot and handle help to confirm a mid-sixteenth-century dating for the carved decoration, which, on a far grander scale, compares closely with the Devonshire lapis-lazuli vase and cover. Almost certainly the cover was not originally intended to be mounted, and consequently would have rested flat, almost flush, with the upper surface of the vase - a true Mannerist design. The addition of both the plain gold rim-mounts, of the gem-set mounts on the two handles, and of the enamelled gold finial set with gemstones and surmounted by Venus and Cupid may have all occurred at the same time. There are, however, indications that the enamelled plinth and figure group may be the result of a second alteration and repair operation. Certainly, the addition of a figure group that was originally a pendant ornament (made with a suspension loop attached to the head of Venus) is indicative of a modern repairer's practice. However, it was an alteration that pre-dates the 1834 Devonshire House Inventory, which reads: “A Blue Lapis Lazuli Vase, fluted body Gold and Enamel Venus and Cupid on the lid”. Consequently, as the object does not receive a mention in the 1811 Inventory of Devonshire House nor in any of the pre-1834 records at Chatsworth, it may be assumed that the 6th Duke of Devonshire (born 1790, inheriting title in 1811, died 1858) was responsible either for its acquisition in its present state or for commissioning the various embellishments. His activities as a collector, especially in the field of hardstones, gems, marbles and so on, are discussed in the curatorial comment of WB.68, and this piece, especially with its nineteenth-century pseudo-Renaissance additions on the handles and the cover, would undoubtedly have appealed to his taste and that of his contemporaries in the circle of the Prince Regent, later George IV. Rudolf von Strasser & Sabine Baumgärtner, 'Licht und Farbe', Kunsthistoriches Museum, Vienna, 2002, p.33.